I hate "lazy" charting, and I think it's important to constantly challenge one's assumptions. During yesterday's session, I began considering the possibility that my initial labeling of the smallish correction back on March 12 as a 4th wave might actually have been correct, and that we were witnessing an extended fifth wave. The rally does have a "blow off top" feel to it, which is characteristic of an extended fifth wave. To try and sort things out, I've charted a few other markets, and as of this moment, the extended fifth scenario for SPX looks quite plausible. That could certainly change with a little more price movement, but I think it's worth considering the possibility, especially since the NYA and RUT seem to support this scenario. Have a look at all the charts and see what you think. Extended fith wave or not, the first thing that definitely bears mention is the fact that if the count below is correct, then wave 3 (or 5 if it's an extended fifth) should not exceed 1408.16, due to the length of red wave 3 (see below). And now the warnings and the take-away. 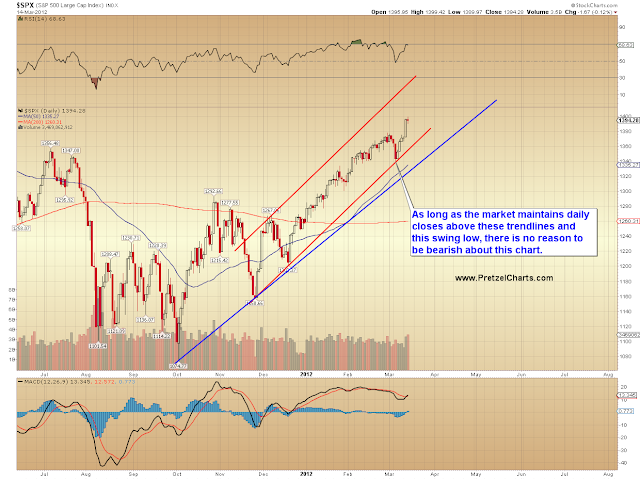 Really, at a larger scale, everything (except for the Trannies) looks very bullish as of this moment. If it's a whipsaw head-fake, that's how it should look... but of course, sometimes a duck looks like a duck because that's actually what it is. If the bears can't turn these breakouts into whipsaws in the near future, then they may have to go into hibernation for awhile. Given all the charts we just looked at, though, it seems the bears may have a black swan event up their sleeves. It is important to realize, however, that until some key levels are broken on the downside, there is no confirmation of anything bearish. 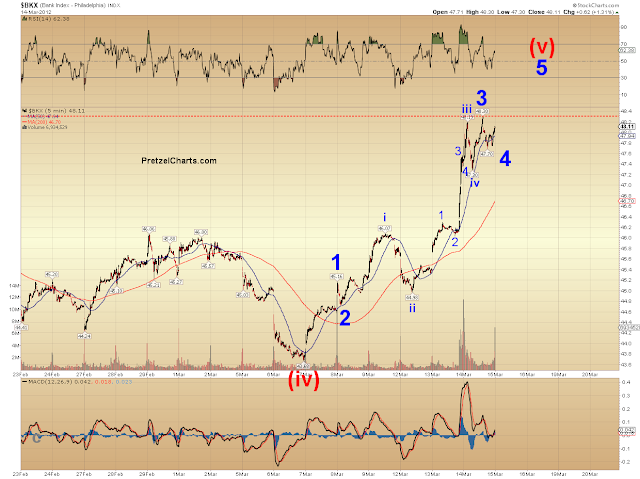 This could be an extended fifth wave, and still only prove to be wave i of 5. Without confirmation, there are only probabilities and speculation. 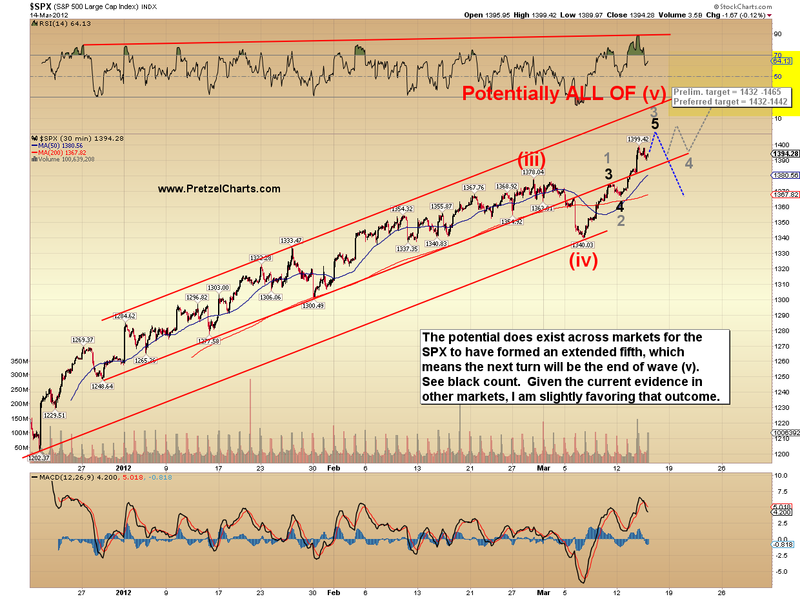 Given the appearance of the structure in all the charts as of right now, there is a decent probability that we are witnessing an extended fifth wave unfold in SPX; aka - a blow-off top. After taking a look across markets, I'm leaning toward that outcome, and it will be interesting to see what the market does over the next few sessions to confirm or deny that theory. 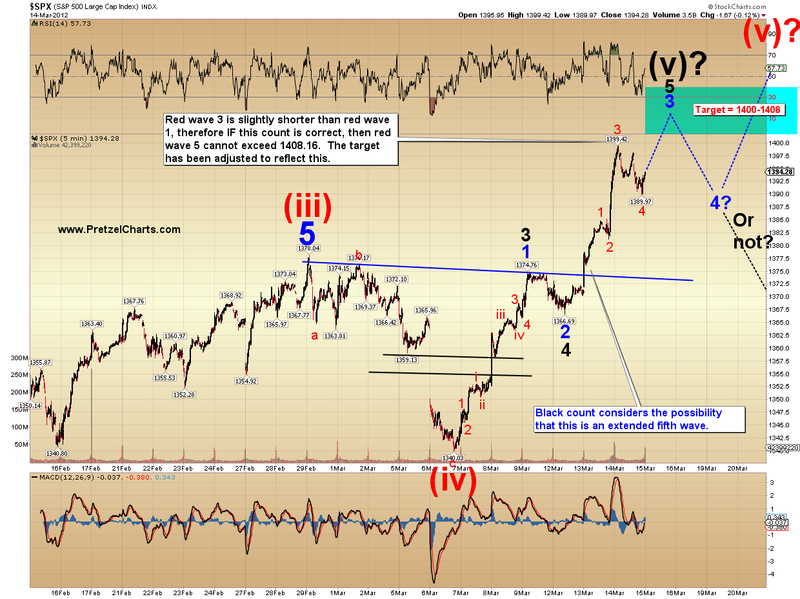 If this is an extended fifth of wave (v), then this next turn will be a big one. Trade safe. I need to take a little break here, bbl. Goodai Pretz - first in tonight. Pity its time to hit the bed. Great post - thanks. Not going to bed just yet... just need to get the heck away from the computer for a bit. Too much charting tonight. LOL - me. I'm off - just waited up to read your words of wisdom - nearly midnight in Australia!! Will catch all the comments for last two hours tomorrow morning - sorry today for you. Anyone considering that we have a short term H&$ top in the ES? 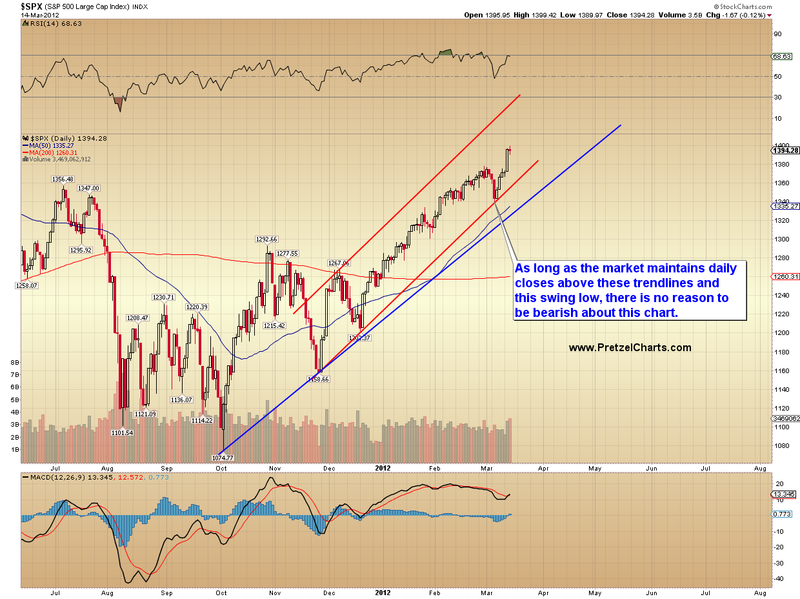 Here is my $SPX chart, I agree with PL. I get 1403 but the candle tails could go anywhere. I am reading this as an EW3, the long slow climb is indicative of a 3. Lookin' for it to break into the EW4 down move at some point. will prolly be news related (California earthquake prediction within 4 to 5 days?). on the ST, mrkt is caught in Globex trading between 90 & 94. FIrst to break and we will go that way. Excellent article as usual....I'm getting spoiled here. I find it notable that "Black Swans" is in the largest font size in the tag cloud. Apparently there is some interest. So, if its black swan, it could be the big war with Iran. Here is what I see Authentic. Sideways actions have been bases, this could be a real quick EW5 to my yellow tgt area, perhaps on the opening. IMO we are almost there. I get 1403 to 05 ES. Glad you brought up blow-off top. AAPL’s recent action reminds me of an analyst’s prediction of AMZN to reach $400 in the late 1990’s Internet craze. 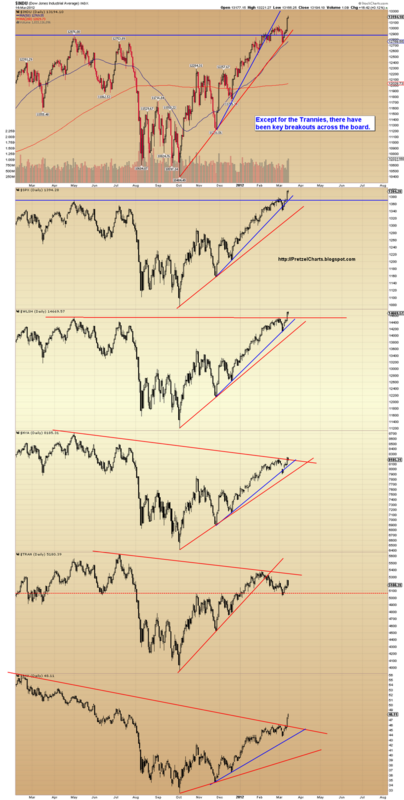 From my limited, IBD-influenced technical analysis, there have been few distribution days among the major US stock indexes and leading stocks are not crashing and burning. Thank you, katzo. I agree with and respect the upside potential. The fact that I was stopped out overnight right at 93.75 and it didn't continue higher, gives me a bit of confidence that "they" don't want it to go that way, at least for now. If it breaks 94, then we're definitely headed to PL's upside target. Right now I am trading it as if a H&S is in progress, unless proven otherwise. Hmm. A swan in a turban. Some image. I also plan to trade the range while it holds. looks like 600$ on apple need to be seen, like 1400 on s+p with slight extension to think shorting..that's psychological and fit with pretzel latest analysis. The CSCO 400 equivalent for AAPL is 5000. It is hard to believe, but AAPL is dirt cheap at 600. I'm still waiting for a dip to get back in. Also look at eur/$$. Action looks like it might break out ST, so not conducive for sell off yet. Who knows tho, these could break apart. PL...I have read that extended fifth's are usually retraced twice.....from the top down to near wave 2 of the fifth and then back up to near the top of five again. With your vast experience, have you witnessed this occurrence in "PL...the early days"
good post PL, you always surprise me! I guess nimble trading is surely advisable at these levels. good morning and good luck all! I actually think AAPL *may* be manipulating their delivery schedules (i.e. delay in iPad3 deliveries) to strategically adjust their quarterly reports to a reasonable (in Apple money) surprise increment. It keeps the machine moving at a good pace. Why do I say that...because that's what I do with my business. Just a theory...may be hair-brained. Also, check out their insider action on good quarters vs. the bad quarters (q3-2011) that may be a tell for a pullback. Just saddle up, hang on and enjoy the ride! AAPL always sandbag on earning time. That was the handiwork of Steve Jobs. Captain Cook may have his own way of doing things. There may or may not be a pullback. But the call options on AAPL are out of this world. People are piling onto all strikes from 600 to 1000. Nice GLD chart from previous thread - I picked up the baby and ran with it! Agree gold must make move soon here, DOW/Gold sittin' right on the "No Pass" Line - typically signifies short term gold rally, no guarantees. Abandoned Baby, maybe. Maybe baby. . . .
UUP has an inverted hammer engulfing on it, think it is bearish for UUP. But lots of fake-outs today, today will be filed with this imo. Okay, on the upside es 90.25 has to hold to be bearish, ST. s&p is running +4.25 above Es. Thanks Katzo...I'm out with a scratch....but it beats a loss...getting too hairy. "fakeouts" - Mercury is still in retrograde, FWIW. today is gonna be a funny day...according to my gut. I'm gonna sit this one out. Vix is just muddling up and down. Maybe Furrrr can help out, but moon is making two powerful contradicting forces bang against each other. Fits with "weird" I guess. Yeah, maybe today will be big time whipsaw day. Just look at the fast down, then up in ES in the last 30 minutes. think AAPl had IT topped, down 16 points from its high, short entry would be 50% of 16 = 8 plus 584 equals 592 area. Getting an ST read on the dollar's been near impossible for a couple days now. Yes. Except if this is the final fifth wave, then it will ultimately be entirely retraced. Looks like a small triangle now on the one minute. Possible larger head and shoulders too. Action's been pretty bearish all night. Had a DX short, but closed it WAY too early. Stupid move... should have been out by 88.5 (worst case). That I lost money !!!!! Albert, did you do a comparison of AAPL now versus MSFT around 1999? I did that a while back for fun. It was interesting. I thought that AAPL would have another 9 months of rally left. Remember, MSFT had a "monopoly" and was unstoppable. They "owned" practically every PC in existence! Would like to hear what your take is on this comparison. Things are not jibing up. Out of ES short at 92.25... scratch. Thanks PL.....what did you do in your previous life? Broker? Bonds are rising with stocks again. ben's favourite scenario. Profit taking from the bond vigilante?? Just wanted to share a few well respected lines I've been following. I read your comentary every morning. Thanks for all the work. What does 'ES' mean that many of you are continually referring to? Thanks! E-mini S&P 500 front month futures contract. Of course, it depends on Captain Cook's execution. MSFT made enterprises more productive and then worked its way into the consumer market. AAPL is exactly the opposite. What most here do not realize is that AAPL is working its way into enterprises. US Air Force, for example, just ordered a plane load of iPAD's for their pilots, maintenance crews and office personnel. That, is but an example of a very powerful secular trend that will last for many years. The takeaway: MSFT improved productivity. AAPL does that, and more. It enhances the productivity and lives of the masses. That, is game changing. The grand trine is separating.... what was easy now becomes more difficult. AAPL - looking at the April options, nearly all green, both PUTS & CALLS. Any thoughts on this? Hey, perhaps you could tell me how to change my display name. Google has been extremely unhelpful in this regard. Astro $.02 - The grand earth trine is separating - what was easy for material success now becomes more difficult. You can literally see this in the night sky as Venus pulls away from Jupiter. We are running out of "Jupiter Juice" for the market. We are still in Mercury retrograde - please remember that I mentioned that trends do not hold - TA gets lost as there are 1-4 day reversals. If we're going to get a surprise of some kind, I favor looking for some planetary interaction with Uranus. Next up, 3//18, with Mercury conjunct Uranus. However, need to stay sharp for the Sun-Uranus conjunction on 3/24 which is near the middle of the Mercury retrograde cycle, the new moon and holds the potential for a short term reversal regardless of the trend. sandy - I've been backtesting astro correlations for Vix spikes and it is complicated due to the front running futures nature of the Vix - in other words, does the trigger happen far before the event? This is a tough puppy to analyze. As soon as I finish I'll post with any relevant data and let the gang decide if it's useful. UVXY and TBT on my plate. option prices goes up on both put and call when you see large price swings on the stock or when a big turn is expected. The option writers are a bigger risk so they require bigger premiums. So Apple and IBM are holding up the market. Furrr, you should write a book on AA - Astrological Analysis. Too many traders are hung up on TA alone, and need superior future oriented technical indicators. Auzies are queuing up for their new iPAD. All countries will take their turn to welcome AAPL's new iPAD as Planet Earth rotates. The market is getting very, very whippy! 2 to 3 point swings in ES within minutes. US/UK are releasing oil reserves in prep for bang-bang prices. So maybe bang-bang will have no effect on TVIX? That would be sad. Were you short? Flux says 2.5 hour downtrend starting in 5 minutes. Market "looks" like it is targeting 96 to 97 in ES. IMO, it is faking you. Will reverse in a few minutes. It'll have an effect...but that's the least of my concerns in the event of a war....I got peeps on the field. Could be... I hope that you are right. six hours ago "ST ES M2 tgt 1396.50" finally made it. For a war signature, we look for a heavy hit astro wise. We do have Uranus in Aries now which has been a signature of historical war events. In June that Uranus square Pluto could be an issue. Saturn is currently retrograde in Libra where it seeks resolution to challenges/roadblocks through diplomacy and mutual agreement. Saturn enters Scorpio Oct 5, 2012 after the second Uranus square Pluto in September. Saturn in Scorpio is not about harmony. I'll post some references this weekend with correlations. Question : futures trading doesn't intrude on the VIX, does it? There was a brief outage of futures trading this morning (bot failure), and am wondering if this will affect the VIX. Or anything at all. Thanks. I see it. The 120 has a cup and handle that projects up to the 1403 or 1404 area, in line with PL's target. The move to 96 or 97 ES I saw from an intraday cup and handle on the 1 minute. Rock R, this is in response to your comment on the previous thread about a possible earthquake hitting the west coast soon...I did some digging and this is kinda freaky. spx looks to be going parabolic. oh it already has..
Nice post, PL. No doubt the trend is up, but I appreciate your pragmatic approach. IMHO, there are still so many negative fundamental issues across the globe... but the market operates on capital flows/liquidity. Makes me wonder if we've reached the top of the worry wall. It's very powerful JB - if I was schmart 'nough, I was play the box only, but NO WAY that's just too easy !! Seeing that AAPL didn't participate at all in this last two hour runup. Short AAPL (very small) and NQ here, with stops over recent highs. Could be... everything is possible. Parabolic runs end somewhere, though, but I don't claim to know where. jbg, tell your peeps "thank you" for their hard work and dedication. I fear that more war may be inevitable... Not in the sense that we should go to war, but in the sense that social unrest, inflation, and shortages have often precluded war. A1, that downmove I mentioned may finally happen at 13:27. ?? 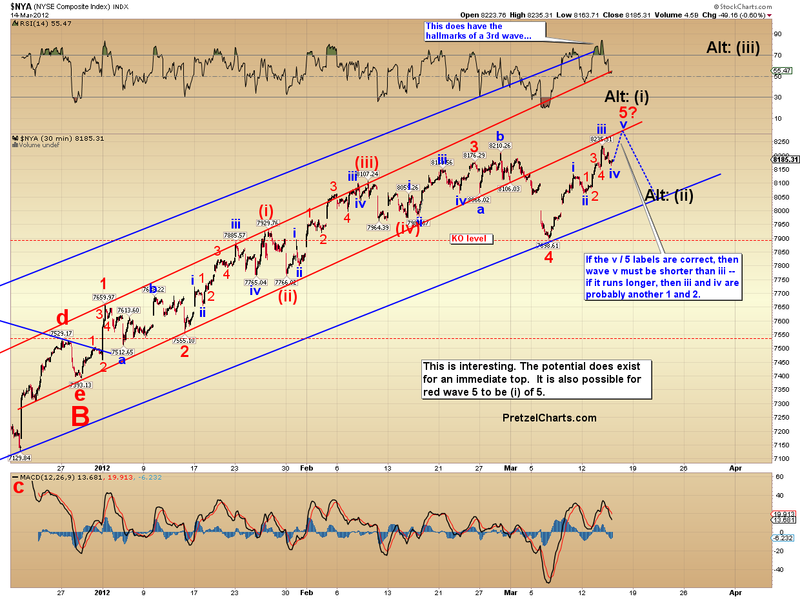 There is a 1-hr down move predicted remaining. We are in a tricky spot. 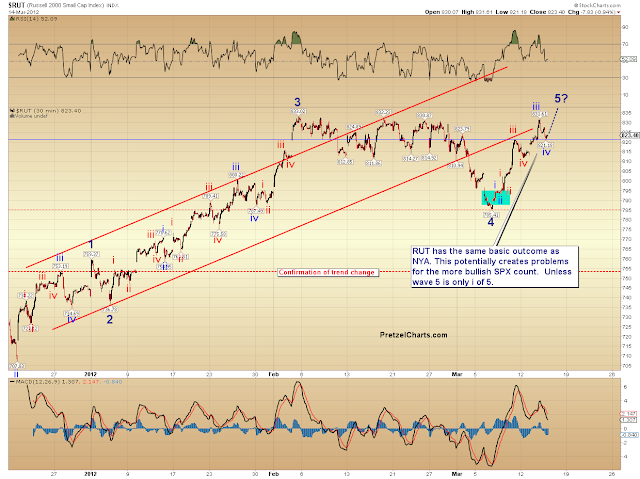 My count shows us finishing a small iv - look for another small five count up in cash markets. It couldn't possibly be that easy....like Homer S. ....I'm SMRT smart. WARNING. the KEY is to close above 1400. if does then i wouldnt want to be short. of course 1380 was the area to crack and it did . buy any and all dips to 1380 is the play as said. well we hit 600 aapl on the head. 1000 next up. may take a year or maybe a week. I am currently short AAPL via puts, entry recorded here. . .
you are doing well then. 579 and counting. By the way, Katzo, do you mind looking at the chart for UVXY, I believe it might be a better proxy than TVIX now. Has it finally turn up and ready to blast?? Saw that. Incredible timing cycle. 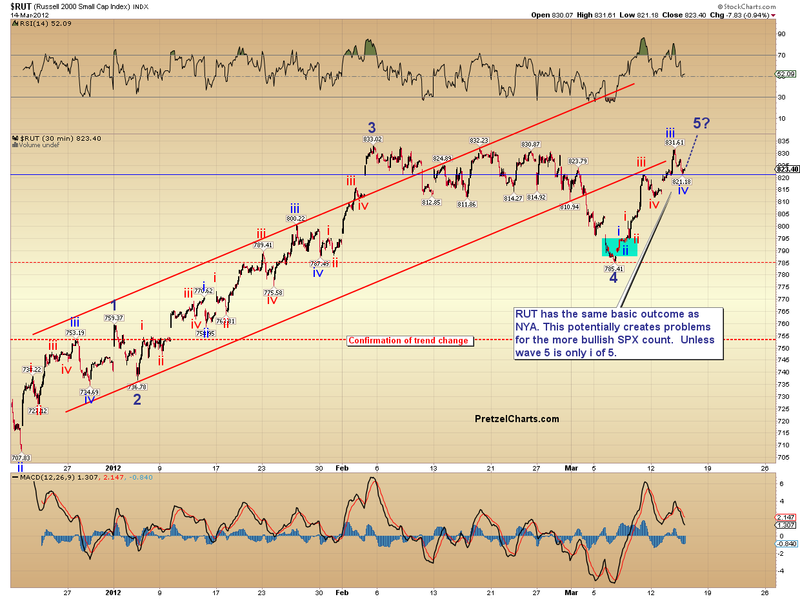 RUT bounced up to 830.45 anyone nibbling on TZA? the game between the dip buyer and the ripp seller is about to start. something as forecasted by pretzel in the cash market 1408 max is possible before to reverse. The 3PM train could give the answer. and Goldman is selling Russell 2000. The banks may all have inside information from FED like JPM did a couple of days ago and I smell something fishy is going to happen. Not yet...frontrunning is bad with them...It's fun when it works...very, very, very not fun when it doesn't. Triangle is forming in DJ and SPX. watching streaming 1 minute hlc bars from 2:25 turn - either a complex iv to resolve up or a nested 1 and 2 structure from HOD. Congratulations on your previous scalp trade. Flux says you have set yourself up for another good one, beginning in a couple of minutes. Man, this is a tough market trade. Thanks, DD. It is a very tough market. I predict 1390-1931 by tomorrow morning. Hey guys, keep an eye on the fact that the markets topped out last year around April 29th. Is the same record playing again? Pssst....hey DD...you might want to clarify that econdsay umbernay. Whew....I was worried....my UVXY would have to go through at least 4 more reverse splits. If AAPL can't close positive today... the parabolic run is most likely over, and sharp declines are due. Gap down tomorrow? 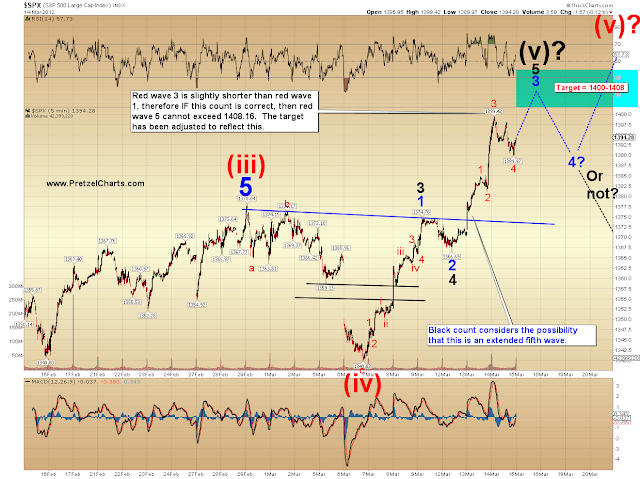 Choppy and overlapping since 12:45 EDT on SPX - looks like a iv with possible upside resolution tomorrow. The cumulative NYSE Advance / Decline Line wasn't able to make up yesterday's net drop, today. Since the January 10th breakout to new highs, this market indicator has been spot on! The first small sign of a potential divergence? Does anyone feel like sharing with me what trading & charting software they use and/or what ones they would recommend? thanks for info.. where do you find buy vix/sell equity signal? I prefer ThinkorSwim. It is very good especially if you are an options trader. What is it with next week? Many black swan predictions. Interesting to say the least. 2.02€ either 10$/gallon of gasoline today In Paris. It takes 3 steps to get a confirmed VIX buy signal. No signal is 100%, it has been busted before, do your own DD.